Night fishing is a great way to escape the commotion of boat traffic and competition of other fishermen, but it requires the right gear. Finding the right fishing flashlight can be a tricky process, so we at Battery Junction have consulted the avid fishing fanatics within our company to determine what qualities make up a good fishing light! Unless you have a buddy there to hold the light for you, fishing flashlights should always be hands-free so you can keep both hands on your fishing rod and reel in that big catch. Headlamps with a floodlight beam work best for night fishermen because they keep your entire line of sight well lit without forming intense hotspots that can scary away fish. Since scanning the water and baiting your hook require different levels of light, having a number of different outputs in your fishing light is essential. Colored LEDs on your fishing flashlight, particularly red and green, can be the X factor that lands you that big cash. Red light gives you all the visibility you need without disturbing the fish below while green light can attract the smaller bait fish that'll draw bigger ones closer to your lure. Finally, any quality fishing flashlight needs to be water resistant so you're not left in the dark by a brief drop in the water. After a thorough evaluation, we've deemed the Princeton Tec Apex LED Headlamp as our pick for best fishing flashlight, featuring all of the top qualities we've listed above. The Apex is a multi-LED headlamp with two different sources of light; a primary spotlight LED in the center for long distance viewing and two secondary floodlight LEDs on either side, allowing you to spot faraway splashes while still being able to get a broad view of the water around you. In addition to standard white, the secondary LEDs are available in both red and green, giving you the option to either attract or avoid disturbing your catch with your floodlight. 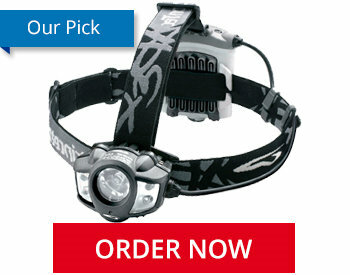 The adjustable top strap makes sure the headlamps stays securely fastened to your head. The fishing flashlight can dropped under a meter of water for up to 30 minutes with no damage so no need to worry even if it slips off. While the Apex is our top choice, it may not be the fishing flashlight for everyone; someone looking to catch catfish in a pond may need a different light than someone reeling in grouper off the coast. Find the fishing light that matches your needs! Trying to find the right flashlight for your next night fishing expedition can be a difficult process. What you need in your fishing flashlight is heavily dependent on your catch, your location, and your method. Catching catfish off your 10-foot jon boat may require a different light than fishing for bass off the dock or snapper offshore. Some fish are scared off by light while others seem to be attracted to it. With plenty of factors to consider, we've broken down a handful of the most important characteristics of a good fishing light to come up with a solid list of lights that will benefit most fishermen. We'll start off with the most basic aspect of any good fishing flashlight; brightness. Night fishing can be a great way to avoid boat traffic and other fishermen, but the lack of daylight can make it difficult to spot your prey even in the moonlight. On top of that, baiting or tying a fly on your hook can be a pain without good visibility. A bright flashlight that offers a max output between 250 and 500 Lumens of light will provide plenty of brightness to see both the surface of the water and what's right in front of you. Higher brightnesses can be useful for certain situations, particularly when going after fish that are attracted to light, but keep in mind such a powerful light source may also do the opposite depending on what you're catching. Getting a fishing flashlight with multiple brightness levels will help you cover all your bases. One of the most useful qualities of any good fishing flashlight is having secondary colored LEDs, particularly red and green LEDs. If you're fishing for something that usually feeds at night like catfish, a moderately white light may be enough to scare them off. Red light has difficulty penetrating through water so it'll be significantly less disruptive to the while still providing you with plenty of visibility. Green light on the other hand can be used to attract your catch. It's been shown that green light can attract smaller bait fish, which will in turn draw larger catches right to you! Getting a flashlight that comes with red, green, or both secondary LEDs will significantly improve your night fishing. Fishing can be a major undertaking that requires all your attention, focus, and most importantly, both of your hands. Therefore, to properly illuminate your next night fishing venture, you'll have to come supplied with a hands-free lighting option so you have both of your mitts free to reel in that big one! For most night fishermen, a headlamp is the most appropriate fishing flashlight; it always shines directly at your line of sight and needs no surface other than your dome to rest on. Most of our fishing headlamps come with top straps for a more secure hold for those rocky waters and a tiltable head to let you choose the lighting angle that best fits your needs. If you're not into wearing your light source or you just need to keep the inside of your boat lit, a lantern with a good diffuser will provide you with plenty of soft light. If you're trying to scan the water for any movement, you'll be more effective with a broader beam that covers a larger area of its surface. While not essential, a fishing flashlight with a wide floodlight beam will give you a more complete look of the surrounding water and a higher chance of spotting your catch. Several of our fishing headlamps offer rotating lenses, allowing you to adjust the width of your beam to fit your needs. The final and most obvious quality in any good fishing flashlight is strong water resistance. The last thing you want while out on the water in the middle of the night is for your headlamp or lantern to break from a brief drop in the water. All of our fishing flashlights are protected from splashing water and the large majority can be safely submerged with no damage, making them safe to use no matter how aquatic the environment!